"I speak as an expert with 12 years of survival experience - The Unfair Advantage book and SEN subscription were the best weapons I could have found." Win the Search Engine Wars! 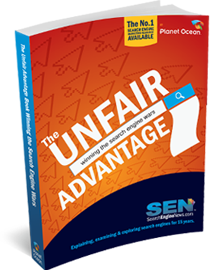 From the researchers and writers at Planet Ocean and SEN, comes this award winning book - considered by members and industry professionals alike as the ultimate pocket book for business owners looking to dominate the Search Engines.